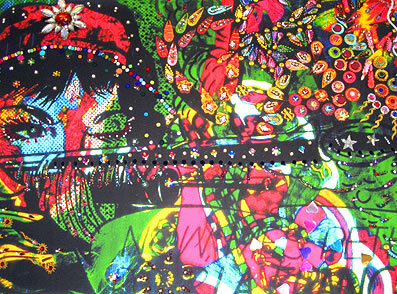 The first in a new series of single work and focused displays featuring key art works from a range of British Black and Asian diaspora artists exploring ideas around technologies, subjectivities and art practice, this exhibition will take the form of a room sized installation of Chila Kumari Burman’s ground-breaking self-portrait prints and paintings from the early 1990s until the present day. Burman’s work in this area has been informed by an incredibly complex creative matrix that draws on a bewildering array of heterogeneous elements: fashion; Bollywood; found objects; the politics of femininity; ‘auto-portraiture’ exploring the production of the artist’s own sexuality and dynamism; the relationship between popular culture and high art; gender and identity politics. Throughout these works is a consistent and insistent commitment by the artist to explore the politics and poetics of print making as an artistic medium and a reproductive technology. For more than twenty years, visual artist Chila Kumari Burman has worked experimentally across print, collage, mixed media paint, photographic and mixed media. She draws on fine art and popular-cultural images and generates powerful pictures of contemporary Asian femininities. A leading figure among UK Black and Asian artists, Chila explores her autobiographical construction within shifting formations of class, gender and ethnicities in the postcolonial context of contemporary Britain.